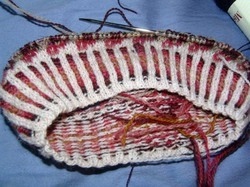 I've been in a funk - no knitting, no spinning, not accomplishing anything anywhere. And so, I took an afternoon to Fiberphilia. Michelle fixed me a cuppa, and I played and touched and felt and coveted. Sheep Shop Yarn, Blue Sky Alpaca and some Claudia's Hand Paint in sport weight found their way home with me. But first, I cast on two baby hats for co-workers' new babies. With the cold weather (-6 F) we finally have, the babies can use a nice warm wool hat! I cast on the baby hat while in the shop. I had a few hours of my kind of people (fiber folks), and a fiber friendly atmosphere to recharge my soul. 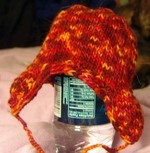 I finished the first hat at home, and did the entire second hat the same night. Both gifts were delivered the next day to their fathers. The colors as usual for painted yarns, did not do justice to the actual yarns at all. Last night, I cast on Swallowtail. I'm always lagging a bit behind everyone else in these things, but I've had my eye on Swallowtail since I first saw it. I am doing this one for a breast cancer survivor. I've knit a shawl of some sort for each co-worker I've had who got a diagnosis of cancer. Some were experiments of sorts, and some were more involved than others. 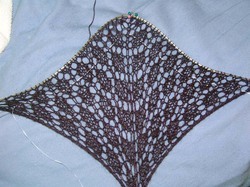 The first one was EZ's Shetland shawl..... others weren't so successful. The only shawls I've knit that I actually still have are the two Faroese shawls I knit for my mother and grandmother and got back after their deaths, and a large baby blanket of Shetland wool that me so long to knit and three re-orders of yarn. Ultimately, I'd lost mom's address and never mailed it, so now I use it for myself on the nights I can't seem to warm up. (One disadvantage of being single). And lastly, I had forgotten how much fun and how addicting colorwork is. 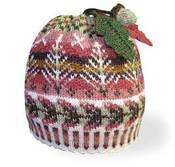 I picked up a kit for a Fair Isle hat kit from Nancy's Knit Knacks at Patternworks when I visited them last year. I rarely get kits, but colorwork is the one place it makes sense to me. This is giving me a taste again for Fair Isle work, and I am starting to think there will be a Fair Isle sweater in the fairly near future for me. A series of barn photos I've taken or been sent. Barns are magical to me - they have so much character, and provide so much for the animals and farmers. These are photos of finished objects, knit pre-blog. Some of these date back to the early 1980's, not having knit since my mother taught me to knit a scarf at the age of six.